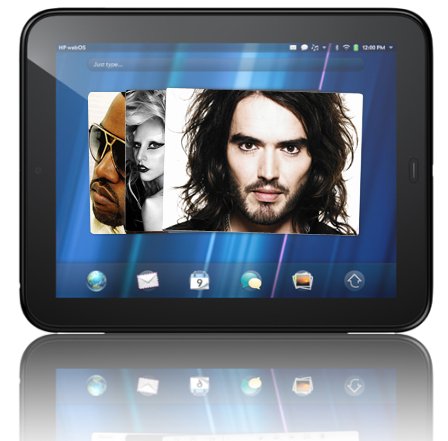 HP webOS Marketing Blitz to feature Lady Gaga, Russel Brand, Jay-Z, Kanye West? We've been wondering when the marketing ramp-up for the Veer would start because to date it's been pretty thin: some spotted Mini Coopers, Manny Pacquiao's supposed involvement, a YouTube ad and NYT ad, and some Lady Gaga antics in the New York subway system. According to Agency Spy, it's coming soon and it's going to be pretty big. They've been tipped that HP is shooting new ads for the Veer and TouchPad with celebities likes Russell Brand, Lady Gaga, JayZ, Kanye West, and Lea Michele. Supposedly HP has laid out upwards of $10 milion on the celebrities, but that wasn't quite enough to get an actual commercial shoot with the Gaga herself, who apparently was kept from the set by Google. All these music celebrities also lends credence to the idea that HP's rumored music service, HP Play, will have a big part in the webOS ecosystem. More important (we assume) than celebrity name dropping to webOS faithful is the rumored dates for the campaign to start hitting airwaves: early June. Source: Agency Spy; Thanks mc_gusto!